Today is a very exciting day. 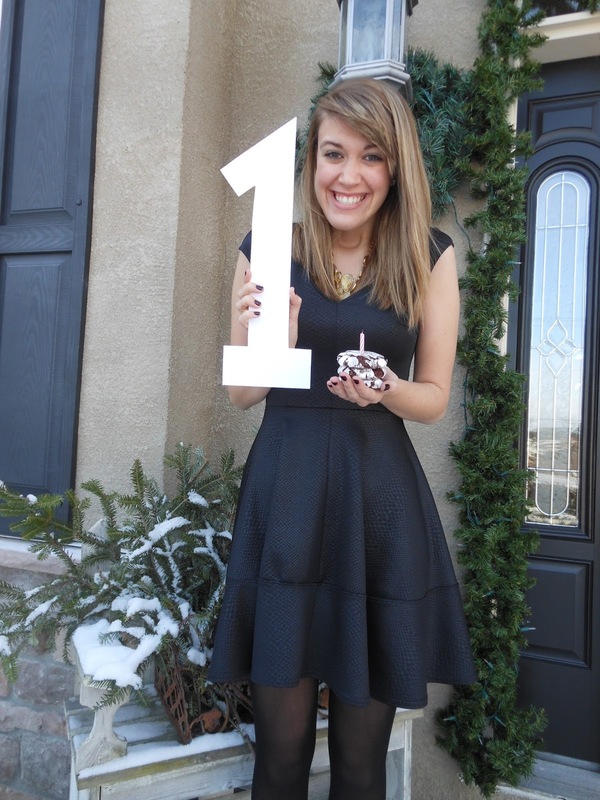 It's my one year blogiversary! I honestly can't believe I've had Dress in Sparkles for a whole year now. It all started just because I was checking a lot of blogs on a daily basis (mainly College Prepster) and taking a lot of boring classes my last semester of undergrad, and I thought it would be fun to start my own. I can remember sitting in my bed and taking the plunge as I navigated my way through GoDaddy and Blogger to set things up. (Most nerve wracking thing ever when you have no clue what you're doing, by the way.) I never thought it would turn into what it is now, or that I would end up loving it so much! I hate to start getting cheesy about all of this, but I think one of my favorite parts about this year of blogging has been all the amazing people I've been able to meet! Other bloggers, store owners, people on instagram....there are so many sweet and wonderful people out there in this blogging world and I'm so grateful that I get to know you all! You all have made my first year of blogging a pretty darn good one. Also, I have to be cheesy again and give a serious thanks to my parents. They've been SO supportive when it comes to my blog, and I definitely would've had a bajillion meltdowns if it wasn't for them. And my nicely set up pictures wouldn't exist without my dad (and the occasional styling from my mom)! So thank you to both of you from the bottom of my heart! My first year has been so fun, and I'm definitely looking forward to the next! There have of course been some road bumps (not actually understanding the blogging world for months and months, feeling overwhelmed, not having a photographer unless I'm home), but the goods definitely outweigh all of that. I can't wait to grow and expand Dress in Sparkles even more this year and continue on this fun experience! congratulation!! i wish you an amazing future! Congratulations! Such a great feeling knowing you've been at it for a year and such a cute dress! Congratulations Kylie!! This is so exciting! Congrats Kylie! I'm glad you started Dress In Sparkles, because you never fail to make me smile! These pictures are no exception, you're adorable! Looking forward to seeing what 2015 has in store for you and the blog! Oh, you look fabulous! Love, love, love this look! So gorgeous! And CONGRATS!! Aw happy anniversary lovey! You are amazing! Get 26% off entire shop with BDAY26! Congratulations! on the first year! You go girl! Yay!!!! Happy blogiversary!! So exciting! You look gorgeous! That little black dress fits you like a glove! Congrats to you! Such a big and great milestone!! Love your dress and tights! HAPPY ONE YEAR ANNIVERSARY to the sweetest and prettiest blogger I know. Love you to the moon and back!! Here's to a hundred more years! Your photographer, your NUMBER ONE FAN, and your Dad! Yayy congrats!!! Lovely dress and pics + love the color added with the shoes. This dress is SO pretty! Congrats on your blogiversary! Congrats! It's a real accomplishment, I have had about a million meltdowns myself while blogging! Happy first year, gal! Thats so exciting. It's so fun to make it a year and look back on your posts. Hope year 2 is filled with lots of success! Have a great weekend cute girl. Happy one year of blogging, so much to be proud of! Keep up the awesome posts! !